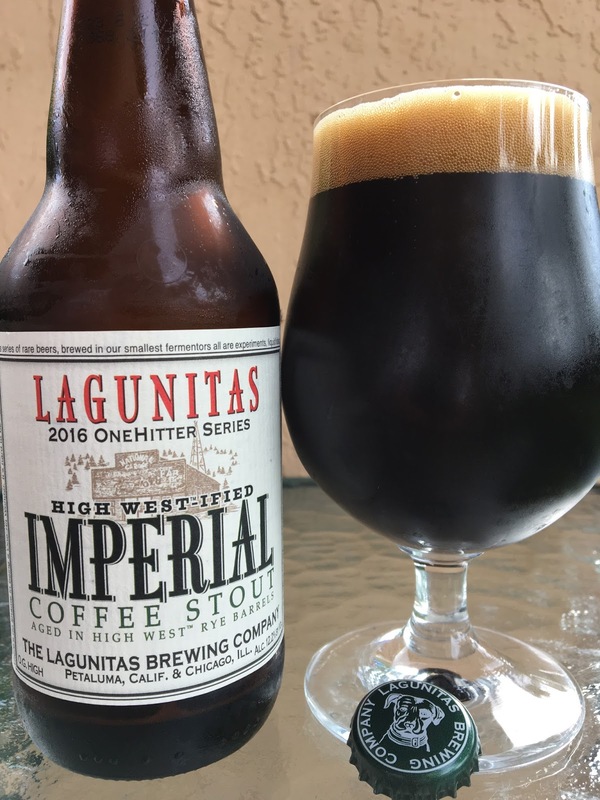 Lagunitas finished off 2016 with a bang! High West-ified Imperial Coffee Stout is their latest OneHitter Series beer, brewed with coffee from Chicago's Metropolis Coffee and then aged for up to 17 months in Park City's High West Rye and Bourbon barrels. The resulting beer clocks in at 12.2% alcohol and O.G. "HIGH". LOL. "There's no shame in being a One-Hit Wonder. It's hard to be right even once. This series of rare beers, brewed in our smallest fermentors all are experiments, liquid ideas, salubrious ruminations built on our 23 years of edgy brewing at the edge of brewing." Beautiful chocolate and fresh coffee aroma with hints of vanilla and a nice sweetness. Flavors start similarly full of rich coffee and sweet chocolate. The spicy rye and sharp whiskey flavors that come next really take that sweet edge off. Brown sugar, toffee, vanilla. Light booziness, heat in the throat. Nicely balanced between sweet and spicy and boozy. No way seems like 12.2% alcohol. Really a delicious treat!